iPhone basics: How do I work this thing? iOS has followed more or less the same design blueprint since its introduction in 2007, albeit with refinements along the way. But what we see in iOS 7 is nothing less than a full-fledged overhaul of the operating system’s look and feel, while maintaining the interface that makes the device so easy to use. From the lock screen to the Settings app, almost nothing has gone untouched visually in iOS 7. Apple has banished skeuomorphism—a fancy word that describes software designed to look like the physical world object it replicates. Instead, we get a straightforward, lightweight interface with an emphasis on thin, space-saving text and high contrast. Gone, for the most part, are richly textured icons; in are simple schematic-like designs with little shading and depth. Likewise, either text or icons have replaced buttons in most places. The remaining buttons are generally very simple—for instance, a circular border with text in it. Whether you love or hate the new design—or fall somewhere in between—it’s going to require an adjustment. 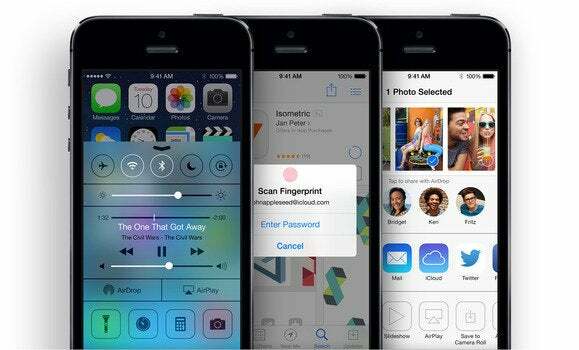 While the familiar iOS lock screen has retained the same key elements in iOS 7, Apple has given it a thorough makeover. 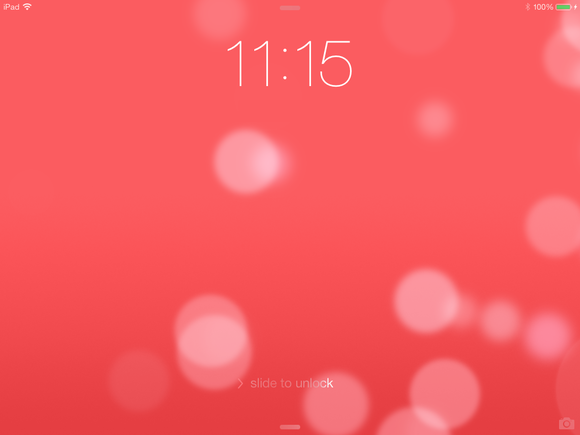 The lock screen has gotten a facelift in iOS 7, with edge-to-edge wallpapers and new widgets. Whereas previously whatever image you chose to adorn your lock screen appeared as a letterboxed image between the clock and the unlock slider, your wallpaper now fills the screen, personalizing your device more than ever. A clock with the current date appears at the top, along with a row of icons for signal strength, carrier, Wi-Fi, battery life, and more. When you swipe to unlock your iOS device, you can do so from anywhere on the lock screen—if notifications are present and you swipe one, it indents slightly, and the device unlocks into the app of your choice. The passcode unlock screen has a translucent effect where the colors of your wallpaper bleed through. 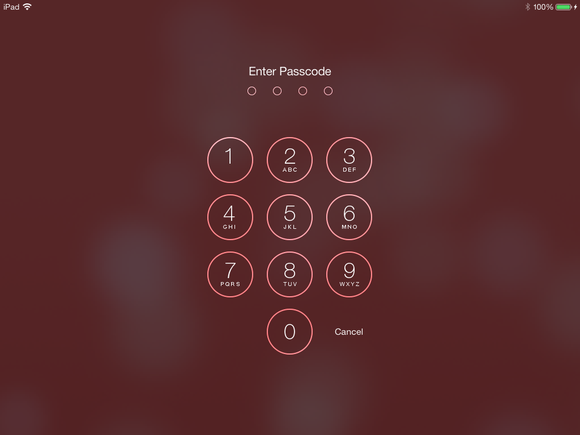 If you have a passcode enabled, when you swipe to the right you’re taken to a screen with a numeric keypad (or, in the case of an alphanumeric passcode, a keyboard), in which you can enter your passcode. At the right is a Delete button for removing a character if you type the wrong one, and (if you’re using an iPhone) at the bottom left is an Emergency button, which gives you access to a phone keypad in case you need to make an emergency call. When media is playing, media controls replace the clock at the top of the lock screen (a small clock then appears in the menu bar). The media players include a play progress bar, complete with a movable playhead; the name of the track, artist, and album; play/pause, previous track, and next track buttons; and a volume slider. 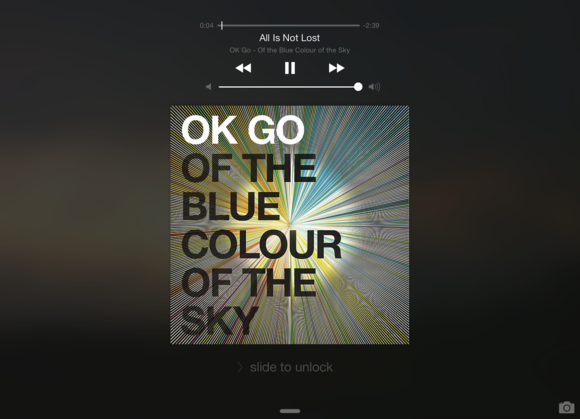 When you’re playing music, the album art appears superimposed, and media controls occupy the top of the screen. You can also still access the camera from the lock screen by swiping upward on the camera icon in the bottom right corner. 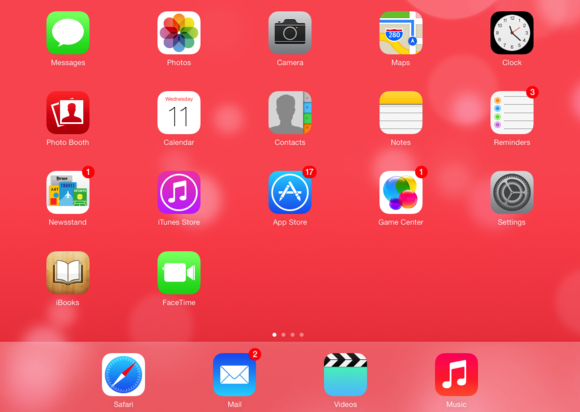 Despite the many changes to iOS 7, the home screen will still look pretty familiar to most users, albeit with a few minor changes. The home screen looks different in iOS 7, but everything works more or less like it used to. The grid of icons you know and love is still present, though many of the icons have taken on a newer, simpler look. Likewise, the dock at the bottom of the screen is now flat and translucent, in contrast to the 3D-styled shelf of iOS 6. If you’re trying to swipe right from the home screen to access Spotlight—to no avail—you’ll discover that it no longer lives on a separate screen. 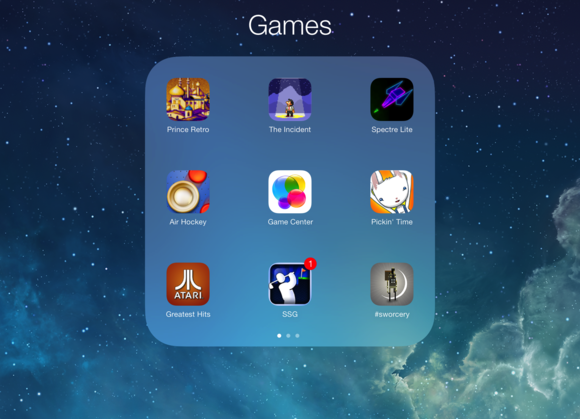 Rather, you summon Spotlight by touching anywhere on the home screen (not on app icons), and then dragging down. Spotlight features a new look, but still delineates by category (apps, emails, events, messages, and so forth), and tapping any result will launch the appropriate app. To dismiss Spotlight, either tap the Cancel button in the top right, tap somewhere outside the list of search results, or press the Home button. The Spotlight field has moved; no longer available as a swipe to the right, you just swipe down on any of your home screens. Folders have taken on a different look as well: Rather than resembling linen-backed drawers, they’re now translucent white icons. As before, they show off the icons of the apps they contain. And though each folder screen contains just nine apps, instead of the 12 (or, on the iPad, 20) they used to hold, you can now have multiple screens within a folder, accessible via swiping. While an individual folder screen holds fewer apps than it used to, you can have multiple screens within each folder, accessible via swiping. App icons themselves get a couple new looks: When they’re updating (which they now do automatically in the background, so you may not see this much), they appear with a circular progress bar overlaid on the icon. And new apps you’ve downloaded but not yet launched have a blue dot next to them, instead of the New banner of iOS 6. 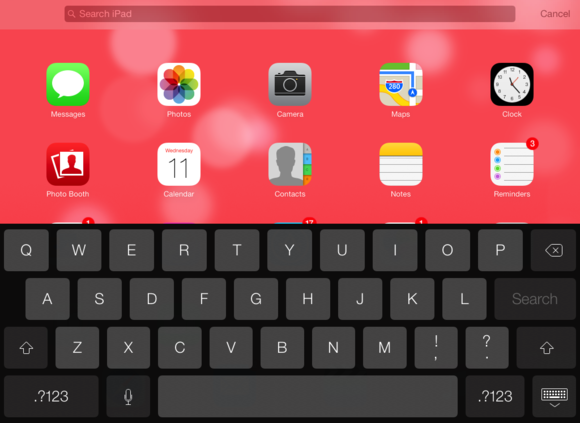 One of the design changes Apple stressed when unveiling iOS 7 was the inclusion of distinct layers. Your wallpaper, for example, lies behind the icons on your Home or Lock screen, and if you tilt your device, you’ll see it shift slightly, as though it’s farther away. But if you don’t care for that look, it’s easy enough to turn off in Settings > General > Accessibility > Reduce Motion. 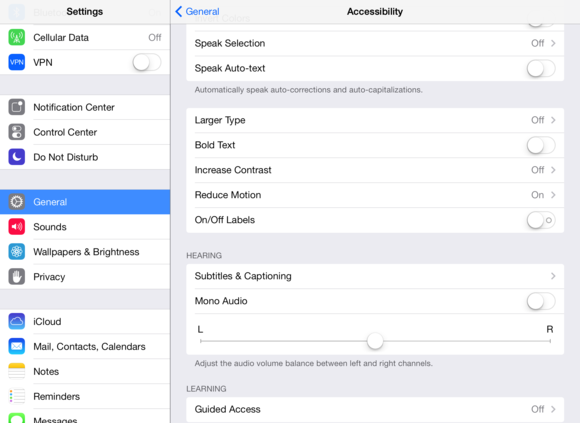 Many of iOS 7’s flashier features can be deactivated in Settings’s Accessibility section. There are also layers that live on top of your icons, specifically the slide-out panels for Notification Center and Control Center. In both cases, you’ll notice that you can see through those panes, getting a blurred frosted-glass look at what lies behind. You can deactivate that option too in the Accessibility section of Settings, by enabling the Reduce Contrast option. Both the transparency and the layered approach are designed to give you a clearer view of where things are in the operating system. That approach extends to gestures as well. For possibly the first time since introducing iOS, Apple has added a new gesture: Swipe to the right to go back or up a level. You can use this gesture in Safari, Mail, Settings, and other apps.